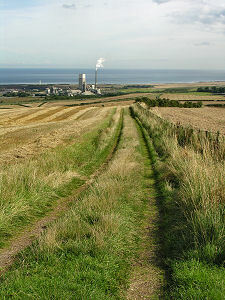 A mile inland from the A1 (and signposted from it), and just over two miles south of Dunbar is the site of the Doon Hill Dark Age Settlement. The last third of a mile to the car park is via a gate and up a track that may not suit all cars. 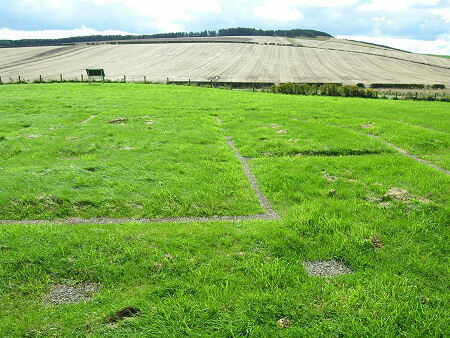 Doon Hill is one of very few locations offering an into the settlement of south east Scotland by Anglo-Saxon Northumbrians in the 500s and 600s and as a result is of great archeological importance. Having said that, your first sight of the field in which the settlement stood leaves you wondering if you have come to the right place. 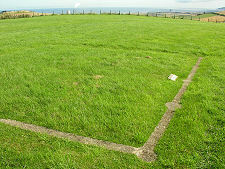 Initially, at least, the field appears empty, the only obvious feature being a distant information board standing, oddly, on the far side of the site from the only entrance. 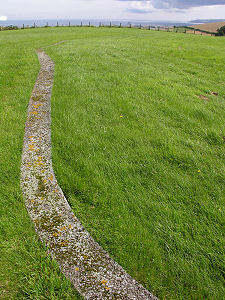 As you explore a little further, however, you begin to realise that the field contains a series of lines marked by narrow concrete paths. These represent the different elements of the settlement found during excavations from 1964 to 1966, and were laid out to preserve the locations of these features for visitors. Doon Hill appears to have been in use during several distinct periods. 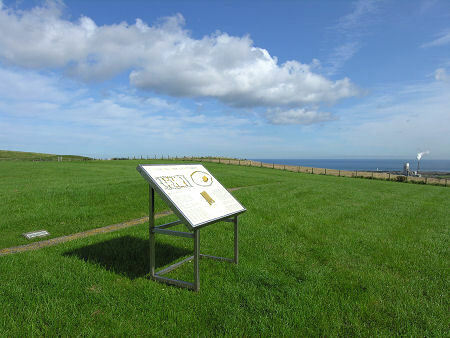 This magnificent hillside location, either magically serene or wild and exposed, depending on the weather and your point of view, was first used as a cremation cemetery, possibly dating back to the Neolithic era. 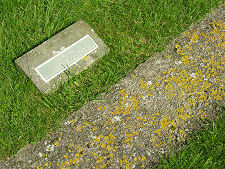 The use of this site for burials may have carried on for a considerable period of time, and at some point a square enclosure was erected around the burials. It has been suggested that this may have been a pre-Christian temple. The burial enclosure or temple may still have been in use when, some time between 550 and 600, a timber hall was built a short distance to the south, and both were surrounded by a timber palisade made from split logs. The hall was probably built for a Northumbrian Anglo-Saxon lord. It was a rectangular structure 23m long, divided into three rooms, and with a door in the middle of each side. After between 50 and 100 years' use, the hall was destroyed by fire. This may have happened during the conflict that led to the Northumbrian capture of Edinburgh in 638: or it may simply have been the result of an unguarded candle after too much mead. Whatever the cause of the fire, the hall seems to have been quickly rebuilt, in a style that suggests this took place in about 640. The second hall was on a slightly smaller scale that allowed it to be erected within the foundations of the older hall. At the same time the palisade was renewed. During this last phase of occupation, burials began to be made outside the palisade rather than within the burial enclosure. 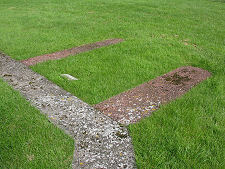 The walls lines of the second hall are marked with a redder concrete to allow them to be distinguished on the ground from those of the first hall. 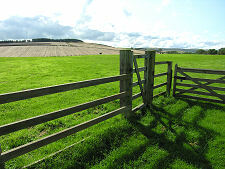 It is not clear when the Northumbrian settlement at Doon Hill ceased to be used. Perhaps times became more settled and the less exposed coastal plain became a more attractive place to live. 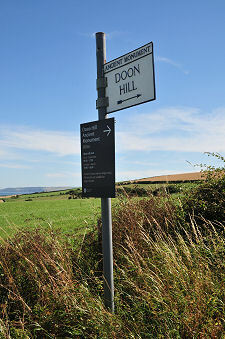 Whatever the reason, the fact that Doon Hill was settled for such a comparatively short period of time means it offers an almost unique view of a little known period. After falling out of use, the settlement at Doon Hill disappeared from memory and record, only coming to light for the first time as crop marks in aerial photographs taken after World War Two.